Super Sol Bamba scores late winner as City beat 10 man Brighton. 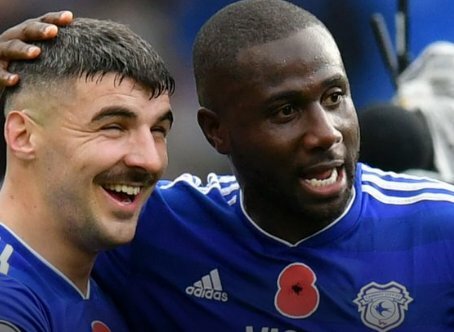 Sol Bamba's dramatic 90th-minute strike gave Cardiff a vital 2-1 win over 10-man Brighton in the Premier League on Saturday, writes Sky Sports. Lewis Dunk's header had earlier put Brighton ahead (6), Paterson replied for Cardiff with another close-range header (28), before Brighton were reduced to 10 men as Dale Stephens saw red for a rash challenge on Greg Cunningham (33). Brighton took an early lead through Dunk's header, turning home at the far post from close range after losing Cardiff defender Sol Bamba from Solly March's dangerous free-kick. But the hosts were level with a header of their own through Paterson, nodding into the net from three yards after Kadeem Harris, making his first Premier League start, caused issues for Brighton down the right flank as his deflected cross looped into the striker's path. And Brighton's task was made harder after Martin Atkinson dismissed Stephens, who had raised his studs in a challenge with Cunningham on the halfway line. Cutting inside from the left, Jose Izquierdo's fierce effort moved in the air and forced Neil Etheridge to awkwardly tip over the bar. Then came the melee which won it for Cardiff. First, Bamba's overhead kick bounced off the post, then Paterson's rebounded strike was superbly deflected onto the bar by Dunk, only for Bamba to react and turn into the net from six yards through the crowd. 11 of Lewis Dunk's 13 league goals for Brighton have been headers.